Besides Singapore, San Francisco and New York are the two cities that I’ve visited the most. This time – from end of May to early July – was my longest stay in SF yet. That gave me the time to live like a local. 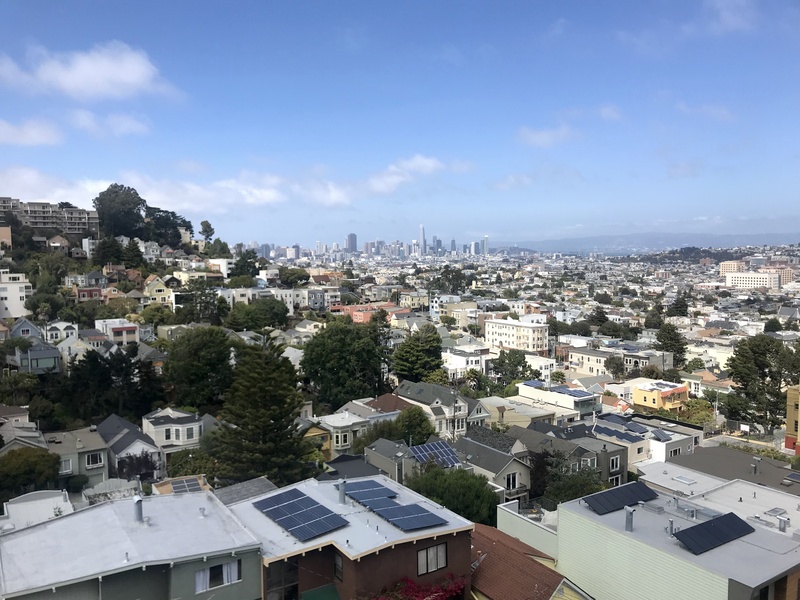 I got to check out and hang out in neighbourhoods like Sunset, Haight-Ashbury, Filmore, and Noe Valley. I also spent a bunch of time in the East Bay – Berkeley, Oakland, and even Union City. Riding Bird/Lime/Spin (electric skate scooters) to work, passing others on Boosted boards, JUMP (e-assisted bicycles), Scoot (one-person scooters), or Chariot (adult school bus). Also ignoring all the homeless people and litter on the way. Cooking what Blue Apron pre-prepared for us, and ordering dessert via DoorDash, GrubHub, Seamless, or UberEats + alcohol via FreshDirect, Instacart, or Postmates. TLDR; in the Bay, convenience is king, and there is an app for everything. And while things like bike shares reduces our carbon footprint, there seems to be a complete disregard for the absurd amount of cardbox boxes we go through. America, the land of great online shopping, free shipping, and drive-through ATMs. I spent my first week using Spacious, a network of dinner-service restaurants that turn into coworking spots in the day. It was great for bouncing around, but not the most ergonomic. I spent the next few weeks working out of Block71, a Singaporean coworking space/startup launchpad/etc. It was conveniently only a couple of blocks away from my place, in the downtown VC loop of South Park. I also worked on my first project via Wethos, a freelancer platform for non-profits. Seeing my ex-boss 4 times, and even attending his 3-year-old’s birthday party. Seeing two old friends: Denis happened to also in town and Ikumi came to visit me from LA and we spent 43 hours eating our way around SF. Meeting all the Canadians. Some at SF’s annual Canada Day party. One via LinkedIn, who then invited me to lunch at Facebook’s HQ. Meeting Twitter friends in person. Lenny, a marketer and all-around good person who I look up to and Sarah, a fellow remote worker. On June 8th, I happened to wake up at 5am (very unusual for me). Right then, news broke about Anthony Bourdain’s death. It really affected me for some reason, though I’ve never even watched much of his stuff. I think it was also partly because I ran into an old flame the night before. He is bipolar, and these two back-to-back incidents threw my mind into a state of chaos and concern. With these high-profile suicides, and increasing suicide rates (of people who seem ok)… Who else is not ok (under the surface)? What can we do to help? Am I ok? We all greet each other with “how are you?” every day, several times a day. And we’re conditioned to give this auto response: “good thank you, how about you?” But (especially with closer friends) maybe we should pause, think about how we’re actually feeling, and give an honest reply. Be open, and open to help. I never really “understood” anxiety or depression, nor was I especially empathetic towards those suffering from it. It never touched me or anyone close to me. I have on occasion felt like a good cry – and I appreciate Hannah in Girls addressing that – but I never thought that meant I’m depressed. “Those are not problems you created, they are consequences of a thrilling lifestyle you’ve embraced,” he said. “Trapped?”, one of them offered. And he was right. I love how more and more, we are realizing the importance of mental health. In recent years, we’ve seen the arrival of apps like Calm and Headspace, as well as organisations introducing mental health days. I think it’s healthy to have these conversations, and to trend towards transparency. Most importantly, it’s ok to not always be ok. Think about the trigger. As per above, I think I know mine: my crazy lifestyle. A lack of stability. Writing this also reminded me of Mind Ease, an app to relieve stress and anxiety by startup studio Spark Wave. I met Paradigm Academy and Spark Wave at the EAG conference, which was the primary reason for my visit to SF. I’ve mentioned EA in many blog posts since I found out about it last year. I also held a birthday fundraiser for the Centre for Effective Altruism last November, and started volunteering with two EA organizations this May. I’m a big fan of the EA school of thought. Simply put, it is an ongoing quest to do the most good and achieve the most impact, whether it’s through our careers or where we choose our dollars (donations) to go. This was the first conference that I paid for out of pocket, that I’ve gone to on my own accord and for personal reasons, not work. I was excited yet nervous. The EA community if full of highly intelligent folk e.g. academics and PhDs researching and trying to solve the most urgent global issues. And sure enough, I was hella intimidated. Many were domain experts in a particular issue. Long-time Effective Altruists. Vegans. “EA Purists” aka those who live on bare minimum to donate as much as possible to EA causes. I did find my tribe at a women’s meet up on day 1 (70+% of EAs are male), and took it upon myself to organize an unofficial Canadians meet up the next day. 2) With the increase in plant-based and clean meat alternatives, it’s easier than ever to take a stand against factory farming + to do good for the environment (and ourselves!) Here’s an essay by Bill Gates on the Future of Food. How do we optimize work? Life? Activities? 4) Apply rationality. Do I know what I’m doing, and why I’m doing it? Summon my deliberate, conscious mind. Realize I’m bored, not hungry, and perform a new action. This is a technique called TAPs (Trigger Action Planning), and I’m excited to try out similar free tools from ClearerThinking. Bar soap. They are cheaper, come in so much less (non-plastic!) packaging, and are easier to pack. DivaCup. I finally started using it in June, and ladies, it’s ok. Give it a try. You’ll never have to spend another dime on pads or tampons and you’re helping the environment! There is so much going on in SF. The day after I got here was Carnaval, another weekend it was Pride, then 4th of July. It was also a very exciting time to be in SF as I got to witness the Warriors just barely make it to the NBA finals, then successfully defend their championship title. Professionally, just in my 2nd week, Microsoft bought GitHub, and Uber bought JUMP. I feel like I have my finger on the pulse here. I feel the energy everyone talks about, and I see the draw of Silicon Valley. I always thought I’d move here, and now that I’m looking to settle down somewhere, SF may just be in the cards 😏 Stay tuned!